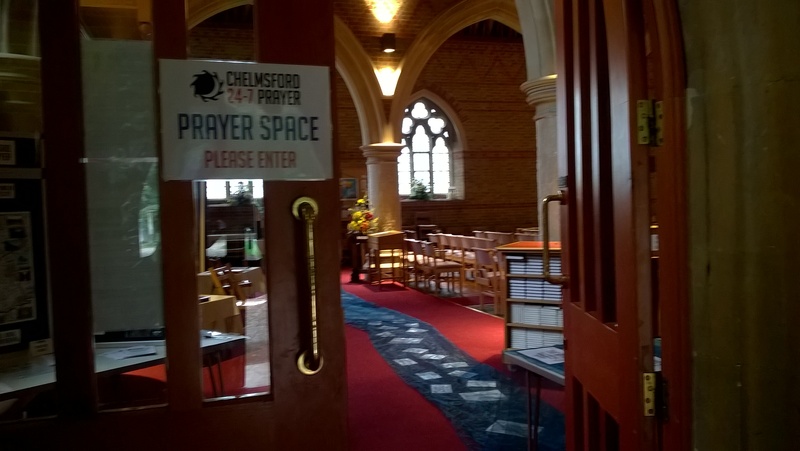 As I post this update, there are just a few hours left before the end of our 2nd Week of Prayer over Chelmsford and District. The Christians of our City have filled 141 hours of the 168 available with Prayer and around 50 people came to one or more of our 5 Prayer Spaces that took place around the City, Monday to Thursday. People from at least 41 churches and Christian groups have got involved. 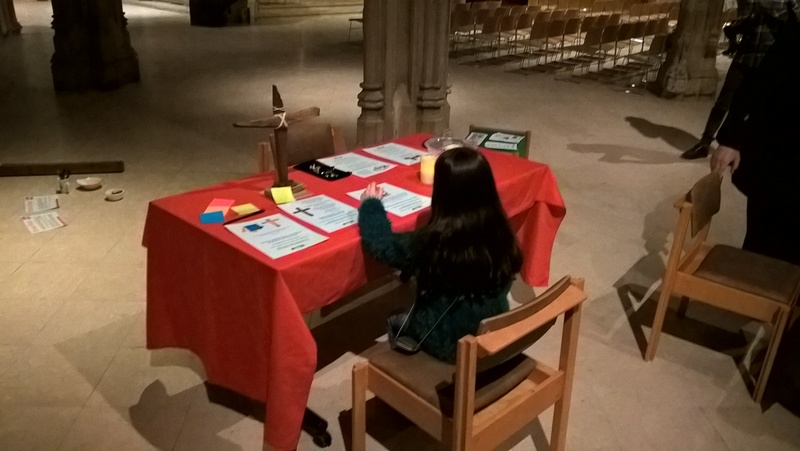 Particularly amazing was that we were able to use the Cathedral Wednesday morning and whilst there I had the opportunity to speak to the Dean, who indicated that we should have a “conversation” about the possibility of being there more regularly. 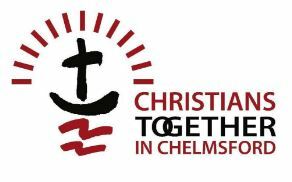 Thank you all so much for being a crucial part of what God is doing here in Chelmsford and District. He is hearing the fervent prayers of His people and cannot fail to act. We have started to receive some “Words” and feedback from those who have already prayed and we encourage you to send us details of what God has spoken to you about. A further circulation of these will be made in due course. You can find a selection of photographs of our Prayer Spaces this week here. 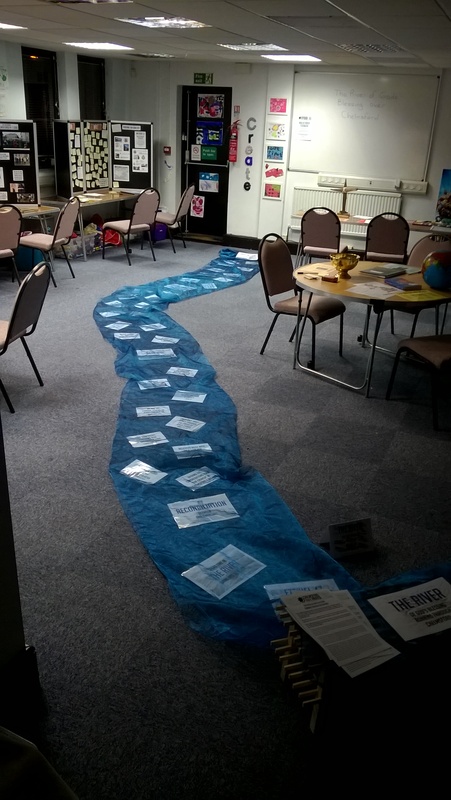 As room allowed, during the Week of Prayer, Prayer Spaces we had a ‘river flowing’. I felt it should be called The River of God’s Blessing over Chelmsford. It carried cards with short scriptures and phrases on them under the three-fold theme of the Week, Reconciliation (unity and love between our churches), Renewal (of our Christian faith), and Revival (of our City). It was also based on the passage in Ezekiel 47: 1-12, which describes the river flowing from the Temple of God. We had some laminated cards which asked people to read and reflect before God on how this passage might apply to them. Read what was on the card here. “It may be October 1st today, but the sun is streaming in the windows and it is a warm and beautiful day. We sit today in a newly refurbished and increasingly frequented and used building that was a church that was ‘dying’ and which had to close through lack of people. Today it now has two morning services on a Sunday, due to lack of space and many. many weekday activities, of which this Prayer space, alongside their community coffee morning are but two. God is certainly doing a ‘new thing’ in this day and it is time we perceived it. He is bringing forth an unstoppable river of His Glory upon the earth – upon this Nation – this City. Can you sense Him doing this? That same morning, a lady I knew who comes from Braintree turned up at the Prayer Space for the very first time. She sat for most of the morning quietly praying and making notes in her own notebook. ‘A desert with wind-turbines in it, turning and generating power; a huge tidal wave about to crash in behind the wind turbines with mighty power, flooding and refreshing the dry, barren land. A little girl bowed down low, humble, tiny, trusting God to save her, others follow suit and do the same. Green trees, grass, plants, etc, grow up around them – like a beautiful garden – a land being healed and refreshed, renewed – lots of light and joy. Soldiers in the same desert looking into the sky at a bright light, a light so bright the soldiers shield their eyes – the wave is coming but it is over-bearing and its power is threatening destruction – the same power that brings life can bring destruction. We had not spoken about any of this earlier, nor had she read what I had written in our Journal. She even sent me a picture of her handwritten notes to prove it! Now what do you think, is God is about to do something really significant here is Chelmsford? Now read 2 Chronicles 7:14 and see what you and I need to do about it? Exciting times, bless you all.